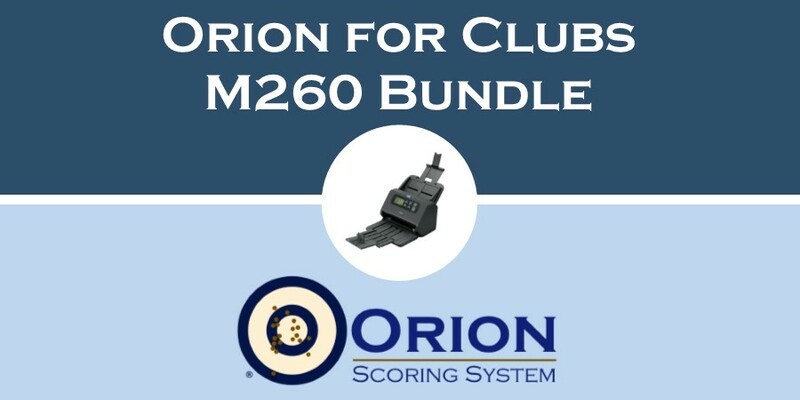 The Orion for Clubs M260 bundle is intended for the medium to large size clubs or teams. Orion for Clubs is the full featured Orion Scoring System. It provides Orion's world-class scoring accuracy, ease of use, coaching tool, Virtual Matches, and access to the Result Center. A Canon DR-M260 high speed scanner. Affordable: Orion M260 Bundle sells for $1668. It includes the first year license to Orion, a Canon DR-M260 high speed scanner scanner, and your choice of targets. Speedy: The DR-M260 scanner can scan about 55 targets a minute. The Canon DR-M260 that comes with the Orion for Clubs M260 Bundle has a 5 year warranty provided by Canon. Extra targets and accessories sold separately.